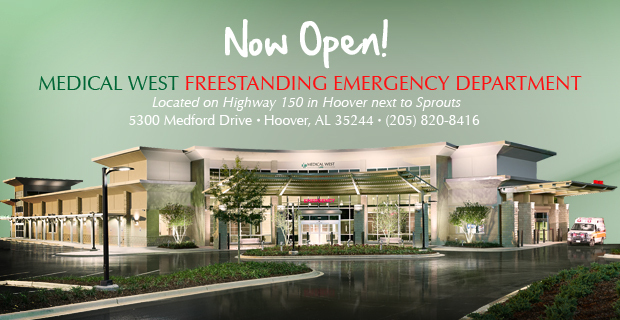 A Freestanding Emergency Department (FED) is open to the public 24 hours a day, 7 days a week for the treatment of emergent medical conditions. Featuring experienced personnel, full-service diagnostic equipment, and 24/7 access; the Medical West FED will provide emergency services equivalent to a hospital-based ED. The only difference is that the FED is conveniently located close to home, instead of on a hospital campus. Should a patient need to be admitted to the hospital, an ambulance is available to immediately transport a patient for direct admission. How is an FED different from a Hospital-based ED? The Medical West FED will provide the same emergency treatment that patients receive in a traditional hospital-based ED. The Medical West FED will also honor the same 30-minute ED pledge as the hospital-based ED, saving valuable time for patients. How is an FED different from an Urgent Care Center? Should the need arise, patients will be seamlessly admitted to a hospital via ambulance or air transportation. No appointment is needed. In fact, we don't take appointments at the Medical West FED. If you are in need of non-emergent care and would like to schedule an appointment with a Medical West physician or specialist, please call (205) 966-WEST.